No matter what Maria V. Snyder writes I will always read her books – even if I didn’t enjoy some but loved others. There’s a excitement when there isn’t much excitement, there’s thrills when there aren’t many thrills, there’s greatness when there isn’t much greatness – basically, what I’m saying, is that some of Maria’s books, although I don’t enjoy them as much as I would like to, there’s a certain angle that I try to avoid when reading so I don’t finish the book disappointed (with the exception of Inside Out and Outside In, which I love and only wished there was a third already! ); I create my own illusion, even if I am bored for the first hundred or so pages and it took quite a bit to get into it. Scent of Magic was one such book. It took a while for me to get into Scent of Magic, much longer than what it took me to get into its predecessor Touch of Power. 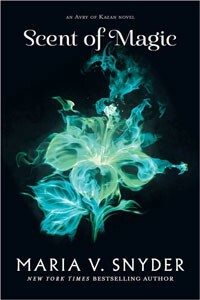 The magical elements of this series are really the only thing that keeps me interested – Avry’s healer abilities, the different types of magicians, the Death and Peace lilies.The plot dragged on quite a bit, making me lose interest easily and not care for much of the book, just wanting it to be over. Scent of Magic was told through Avry’s (in first) and Kerrick’s (in third) perspectives, presenting a change from the previous book and allowing us to follow Kerrick as he tries to accomplish an objective in his part of the kingdom as well as Avry as she… to be honest, I never understood why she did some stuff in Scent of Magic – oh yeah, because she was thought to be dead and still tries to be the strong heroine this fantasy world so desperately needs. Kerrick’s chapters were quite quick with only a few pages in each so I suppose I found myself more intrigued with his storyline than Avry’s.Avry underwent quite a bit of transformation in Touch of Power. She went from being a secretive and innocent girl with the ability to heal, and the last of her kind, to a strong-minded and determined heroine following the likes of Yelena, Pearl and Trella. Avry taught so many of those around her how to do certain things and became someone others looked up to. I was expecting something much more from Avry in Scent of Magic, something different, but she remained the same, teaching people, healing people, deceiving people (for the betterment of others). Of course that’s the type of individual she is, but she seemed less independent in Scent of Magic than when we first met her as every chapter has her wondering where Kerrick is, what Kerrick’s doing, if Kerrick’s alive, if Kerrick’s dead, how will she survive without him – there was just too much of it. I like you, Kerrick, but… GET OUT OF AVRY’S HEAD! She was independent before you came along and wrapped her in your leaves and vine-like grip.Reflecting on the world in the Healer series I have found it to be one of the weakest links for me. The names of the countries and towns all blur together and aren’t as distinct as, say, those in other epic fantasy and not-so-epic fantasy novels and series. Although there is a map in the front of the book, I didn’t use it at all because I felt like there was no use in trying to follow where each of the characters were at what time since all I really see are trees because of Kerrick. The setting is unmemorable and I only wish Taste of Death, the third book, lets me experience and understand everything rather than just observing everything, such as the mechanics of the lilies.Taste of Death: You will either be bitter and disappointing, resulting in my death, or transform the days I’m reading you into opposite day and become ‘Taste of Life’, making me content with how the trilogy ends. I sincerely hope it’s the latter, because I don’t see myself succumbing to the terrors of the Death Lily.A big thank you to Harlequin Teen Australia for a providing an ARC to review.